Dr. Sam Stewart runs a remote medical clinic on Hope Island in the Great Barrier Reef. She's a GP, but in her spare time she and her colleague, Pharmacologist, Gus Cochrane, spend their spare moments chasing venomous creatures to discover the secrets of venom. When the mainland University Hospital wants more venom for research, Sam pleads with her ex-husband (and boss), Andrew, to send her a new doctor to assist her in the running of her remote Hope Island Clinic. The new doctor Rick D'Alessandro — an arrogant party boy who thought he was going to a medical centre at a 5-star island resort — arrives during a medical emergency when a scuba diver surfaces too rapidly and gets the bends. Together with Toby McGrath, the local dive-boat operator, Sam and Rick work together on a dangerous recompression procedure to save the diver from potential brain damage — or death. Sam, Gus and Jack are hunting for monitor lizards when Andrew calls Sam inviting her to the mainland uni to give a lecture to his medical students. Sam can't see the value in going to the mainland and is provoked when she overhears a rival researcher criticise her venom work as a hobby. A honeymooning couple from the Backpackers finds a magical swimming hole with a deadly secret lurking beneath the surface. The new bride steps on a stonefish, and Sam and Rick argue over whether or not they should give her anti-venom. The discovery of the stonefish habitat offers Sam and Gus a new, exciting venom project, but Sam has to figure out a new way to extract venom from a stonefish without killing it. After her research boat's motor breaks down, a reluctant Sam agrees to give a paid lecture to Andrew's medical students at the university hospital. Toby takes her to the mainland, promising to find her a replacement outboard for the price of the lecture. When she arrives she finds the University's research labs have been extensively upgraded and her rival, Malcolm, is now running them. Andrew is disappointed Sam didn't convince Jack, his estranged son, to come with her. Sam gives a successful lecture, but is ambushed by one of Malcolm's PhD students questioning her about her venom work. When she complains to Andrew he tells her things have changed at the uni — and suggests she come back to work for him. Not as a Doctor but as a Research Scientist. Sam doesn't care if he's established the top venom lab in the universe — she is not working with Malcolm. Sam flees back to Toby's boat. Sitting down with her new outboard she asks Toby to take her home, she's had enough civilisation for a while. It's Freya's first day off in weeks and Sam wants to get her out and away from a computer, so she and Gus offer to take her on venomous spider hunt. Freya is excited to see what Sam and Gus do when they are not working in the Clinic. When Gus slips and falls — into a Gympie Stinger Bush — her trip into the rainforest is cut short. Treating a tortured Gus at the clinic means a long, painful procedure to remove each of thousands of toxic needle-like hairs. Sonny offers to take Freya snorkeling and she accepts — anything to avoid hearing Gus howling as Livvy uses hot wax to strip off the hairs. Freya has her first close up look at the wondrous reef. It's when Sonny loses consciousness and nearly drowns that Freya experiences a real test in emergency medicine. It's a hectic Clinic day on Hope Island that offers a chance for the team to catch up with gossip and have a cup of tea with the locals between consultations. To Rick, the influx of extra patients is like being back in a proper ER and he doesn't take time to listen to his patients. Being impatient, he has a tough time dealing with Barry who has a problem revealing the reason he has come to the Clinic — and gets a lesson when he ignores the advice of a nursing aide. While trying to discipline Rick, Sam has her hands full with a pregnant woman whose birth is not going quite to plan, and Toby runs into an obstreperous youngster while babysitting children on the beach. Gus has to deal with two amateur snake collectors who have sought him out after reading his new blog, and he gets a lesson of his own when the hero-worshipping herpetologists let a deadly snake loose in the crowded Clinic. Andrew tells Sam that her clinic might be in line for an upgrade, but when she heads to the Uni to sort out the details — she discovers he means only if she hands over her venom research to an independent research foundation. Sam refuses and insults the foundation representative, James McCabe — accusing him of wanting profit before medical breakthroughs. Back on Hope Island, Rick is pursued by an infatuated tourist who danced with him at Sonny's Bar the night before. So as to not reveal where he works or what he does — he sends Chelsea and her friend Brianna off an a long trek to the Butterfly Grotto. But being unfamiliar with the island, he doesn't know a big, very inquisitive snake lives at the Grotto. When the girls fail to return for dinner, Sonny sends out a search party. Rick is forced to admit what he has done — and soon has an even better reason to hide from the girls. On one of his secret dives, Toby finds a coral encrusted relic on the seabed. When he suddenly sees a shark circling above, he panics and gashes his arm, attracting more sharks. Trapped underwater, Toby sends out a distress signal. Sam, Gus and Jack rescue him, and Sam demands to know what he was doing, why he panicked at the sight of a few sharks and what has he involved her son Jack in. Toby refuses to answer her questions, and Jack resents his mother's interference. To make matters worse, Sam sees Toby meeting with the mysterious Erica. Livvy tries to assure Sam — Toby adores her — but Sam is worried. Meanwhile, romance is in the air as Gus asks Livvy out, and Rick and Freya discover their mutual attraction when Freya takes Rick rock climbing. Sam collects deadly cone shells from the reef, and Gus is pleased when she presents him with some fine specimens that he can milk for venom. Everyone is excited to hear the Foundation has agreed to fund Sam's venom cream trials, however, the celebration turns sour when Andrew calls back to tell Sam her rival Malcolm will conduct the tests. When Malcolm flies to island to see her lab for himself, Sam makes sure he doesn't get a chance to read any of her findings. To Livvy's surprise Malcolm is charming, and she is unsure why Sam dislikes him so much — especially as Sam needs the funding to continue her research. Sam takes Malcolm out on a sea snake hunt and she hopes he will be so terrified he'll want to leave Hope Island. However, the plan fails when Malcolm gets caught up in the thrill of the chase. He returns to the Clinic with a renewed determination to get Sam's data and pursue the lovely Livvy, but he doesn't know about the dangers in Sam's lab. Sam and Jack are excited when two close friends Megan and David — renowned husband and wife wildlife film-makers — come to the island for a bit of R&R and to film out on the reef for a segment of their latest TV series. While they are diving, their boat's anchor is pulled from the sand — and the boat drifts away. Megan and David surface to discover they are lost at sea. At the Clinic, Sam is forced to decide between joining the search for her friends, or assisting a dubious Rick with an extremely risky medical procedure that involves stopping a patient's heart. Finding the missing divers comes down to whether Jack can convince the search police that he knows where Megan and David could be. It's a big day on Hope Island as Sam has arranged an ash-scattering ceremony for her beloved father Hamish, who died over a year ago. Jack is angry — Sam has invited his estranged father Andrew, the new girlfriend and her daughter. But it is what Jack's grandfather wanted. When Andrew arrives with Gillian and teenage daughter Phoebe — Jack's prediction that the day will be a disaster seems to be coming true. An obsessed Gillian doesn't like anything Sam has organised for lunch, and Phoebe hates the island because she can't get a signal on her mobile phone. When the ceremony ends with Gillian getting dusted in the scattered ashes, Sam realises Andrew's new partner might have a medical problem. Just as Sam starts to comfort Gillian, Andrew has to cover for her when Nell is bitten by a 'zombie' snake. A wild storm heralds the coming wet season and damages the clinic's satellite dish. The visiting repairman happens to be an old mate of Rick's. Freya is initially intrigued to learn something of Rick's past, but she soon discovers Scottie is not the friend he claims to be. When Rick and Scottie have an accident in one of the island vehicles — Rick discovers the answer to a riddle that has plagued him for years. At Sonny's Backpackers a young man Paul, arrives and starts to help Sonny repair some storm damage. But who is the handsome stranger, and why is he so interested in Sonny? Sam, Livvy and Nell grow suspicious — he must be up to something. When Toby finally finds a relic from a shipwreck that will triple in value all the artifacts he has so far collected, an excited Erica flies out to see the piece for herself. Down at the beach a long-distance swimming champion Emma and her father Brian are training when Emma collides with a kayak. After her grueling medical emergency, a suspicious Sam comes face to face with Erica, and takes an immediate dislike to her. Jack thinks Toby is up to something when he refuses to talk about some old charts belonging to Sam's father, that show the position of a possible shipwreck. Toby adamantly tells him to mind his own business. Erica, realising that Sam is a threat to her plans, warns Toby his time on Hope Island is up. It's 'stinger' season and the arrival of dangerous Irukanji jellyfish shuts down Sonny's Beach. Sam realises her father's old journals and marine charts might provide clues to where she and Gus could find enough of the jellyfish to collect for her venom research. Sam decides to dive at Angel Reef — which is where Toby has been taking relics from a shipwreck. 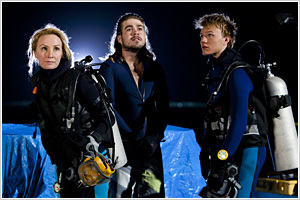 Jack, suspicious about Toby's activities on the reef, is determined to join Sam and Gus so he can search for clues. Metal markers on the seafloor confirm what Toby has been up to. The discovery hurts Jack, and he accuses Toby of being untrustworthy and not deserving his mother's affection. But before he can tell Sam what he knows, he is accidentally stung by an Irukandji. The Hope Island team find themselves fighting to save Jack's life, and they truly learn why the tiny jellyfish is one of the world's most deadly marine creatures.